The weekends go far too quickly, especially when you’re having so much fun! I’m sure I’m not the only one who is never ready when Monday rolls round. I usually try to get my Living Arrows post written on a Sunday night, ready to publish on a Monday morning, but last night that just didn’t happen. I was just far too tired after a busy weekend, and I was also busy trying to finish off my list for my second attempt at 101 things to do in 1001 days, which will start on 1st November. So keep an eye out here for updates on that! In the mean time, here’s this weeks Living Arrows post.We had a bit of an eventful start to the week, after we found out when we got home from St Ives that our hot water and heating had died a death. Thankfully we have boiler/central heating cover etc and arranged for them to come out on Tuesday morning….which came and went, and no one turned up. The appointment kept getting pushed back further and further. Despite the fact we are classed as a “vulnerable customer” due to having a young child….yet the engineer ended up turning up at about 10pm…after many many phone calls! Anyway, it turns out the a valve had gone on…something! The pump had also gone upstairs, and so that kept blowing fuses whenever we tried to turn the heating on, and also the boiler (being so old) was so clogged up that not enough gas could get through to light it! The engineer had to come back again on Wednesday morning, as he needed to get various parts, but it all got done, and in the end we managed to get several hundred pounds worth of work done for just £30 (I complained about it taking so long for someone to come out and no one updating us with what was happening, so they refunded half the excess charge back!) And now we are toasty and warm again! The weekend was great though. We headed down south to stay with some of my most favourite people in the world, and then on Saturday my Brother-in-Law got married which was a great day. Always so lovely to see all the family together. And watching Isla dancing and playing with her cousins was just so heart-warming! I was so busy having a great time, that I didn’t take any photos at all!! 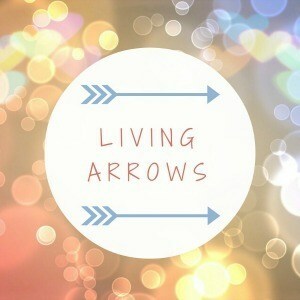 This weeks Living Arrows photo was taken on Sunday morning. 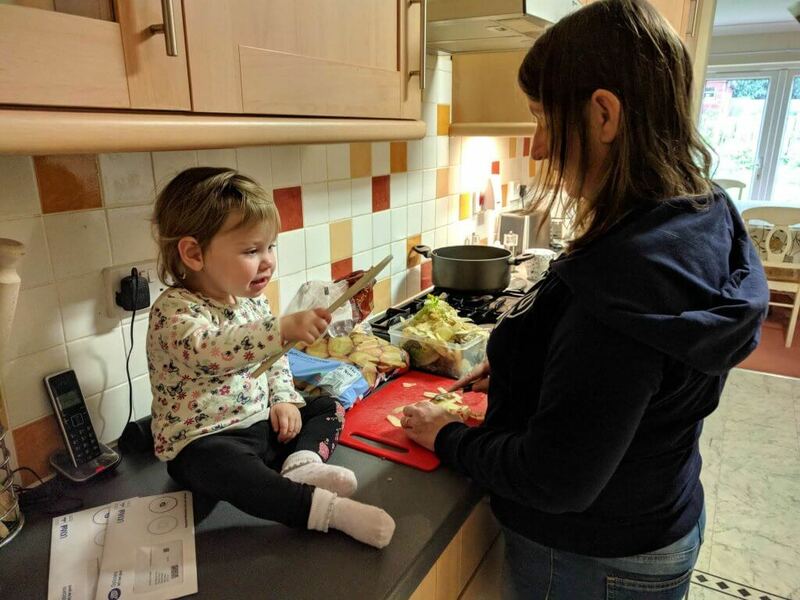 Isla decided she wanted to “help” Sam prepare Sunday lunch! 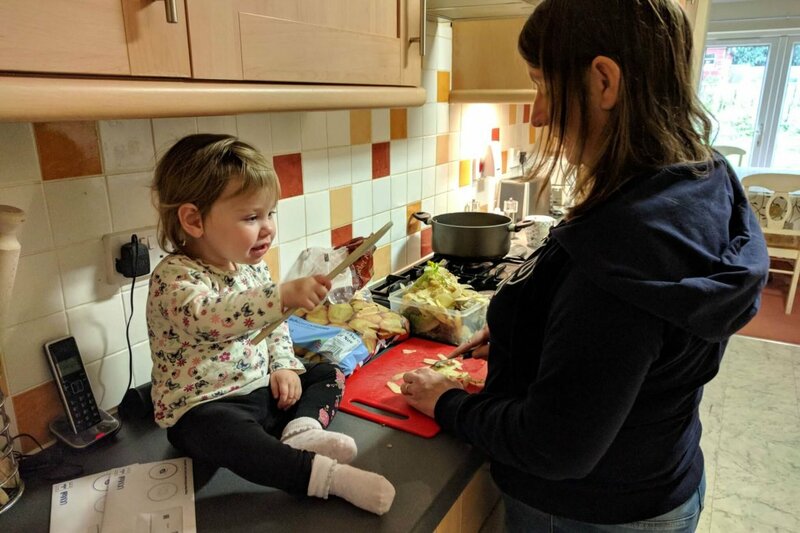 Whenever Mum is cooking, Isla wants to sit on the counter next to whatever is happening, so that she can watch what is going on, and help if she can. She loves to stir sauces and whatever is in a pan, but we tend to keep her away from boiling water etc. It was so lovely that Isla wanted to do this with Sam as well. Sam is family to us (she was my Nanny when I was little…in fact she started looking after us when I was just a month old than Isla is now, and we’ve always kept in contact since) so it’s so nice that Isla loves spending time with them too. She had a wonderful time playing football in the garden, and playing with, and then destroying, the Happy Land town that Sam’s kids made…obviously for Isla to play with, not for themselves!! I hope you all had a great weekend too. What did you get up to? Sounds like a nice weekend! We had a relax at home and it was absolutely fantastic!